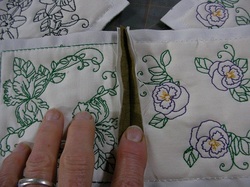 Here are the instructions for the tablerunner. If I have missed anything or anything is unclear, just let me know and i will add it or fix it. Please read through the instructions to the end, so that if something is unclear, or you don't understand, we can address it before you start. To start with you will need to lay your blocks out in the pattern that is most pleasing to you. You have 3 iterations of each design, so you have a lot to choose from. For this raggie method, you will want to trim your batting to the seam line, and then trim your blocks to at least 3/8 of an inch. you will start at the top, and we are going to put them together 1 row at a time. 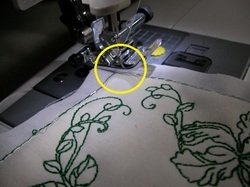 Take the first 2 blocks, (refer to diagram 1 for placement) 1 and 2 and place them backsides together, keeping the stitching lines as close to on top of each other as possible. 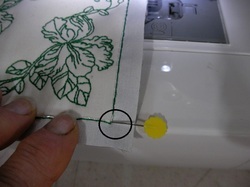 Be sure to start your stitching in the corner of the stitching square, and continue to the end corner. 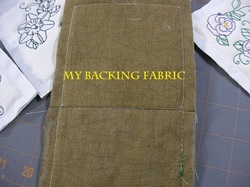 Do not stitch out into the seam allowance. I backtack at the start and the end, so that you do not have anything coming apart. This is basically the only thing that will keep the blocks together. so be careful here. Don't worry if they are a little off, as the ragging will cover any small mishaps. This is what your blocks should look like when you complete this step. Then stitch the no 2 and 3 blocks together, following all directions above. Now you will clip out each corner piece from this line. That completes your first line. 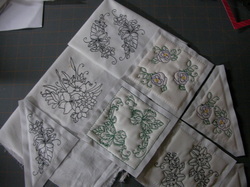 You will complete each row the same way until you have them all stitched. That should keep you busy, I will update this page this evening with more direction.